Here is a brief report from Missouri SEC W0KRB, just forwarded by Dale Temple, W5RXU, Arkansas Section Manager, at press time: "Thanks to all who volunteered to help provide radio support for the Joplin tornado. Last night, Amateur Radio was used to provide communications between Freeman hospital (in Joplin) to the hospitals in Springfield to help provide information about resources needed in Joplin. We also had a link-up for Red Cross between the main office in Springfield and the satellite office in Joplin. "John Howard, K0VET, activated the Missouri Emergency Services Net (MESN) and it was up until 2300 hours last night. It ended up steering a lot of people to the proper Web site for health and welfare messages. The hospital requirements for radio communications were terminated at 0900 this morning and at 5:00 PM tonight we are on a standby status for Red Cross between the two locations. "We still have a couple of the Jasper County ARES® and Newton County ARES® members providing communications between the Red Cross Shelter and the HQ for Red Cross that was set up away from the normal chapter office as this is now a national-level Red Cross response. It is anticipated that this need will be fulfilled by noon tomorrow. The Associated Press called the event the worst single tornado disaster since 1950. On April 27, 2011, two waves of tornadoes hit the region, causing massive damage and communication failures involving land-line phones, the Internet, and cell services that were severely impaired across Alabama. More than 600,000 residences and businesses in north Alabama were without power for over a week. The Amateur Radio Emergency Service (ARES®) successfully provided critical communications for multiple organizations. The time spent practicing and training on nets and exercises, building relationships and hard work paid off for ARES® when this disaster struck. ARES® worked. Madison County AEC Alan Sieg, WB5RMG (l), and Southeastern Division Director Greg Sarratt, W4OZK, Alabama tornado disaster. tornadoes traveled 20, 6.6, 2, and 26 miles in length; 130 high tension high-voltage line support structures/towers were demolished; 11 high-voltage transmission lines were out of service. The President declared a Major Disaster for Alabama: the Federal declaration encompassed 42 counties. The NWS in Huntsville issued 92 tornado warnings, 31 severe thunderstorm warnings, and seven flash flood warnings. ARES® operations began at 4 AM on Wednesday, April 27 as severe weather tracked into Alabama and continued to operate for the next 12 days. ARES® supported the State Emergency Management, local county Emergency Management, National Weather Service, American Red Cross, Southern Baptist Disaster Relief, The Salvation Army, and Volunteer Organizations Active in Disaster. Amateur Radio had to face and contend with a major disaster scenario. A major city, Tuscaloosa, was severely hit, with multiple communications towers down, multiple counties and disaster areas involved, commercial and Amateur Radio repeaters gone or not operational, main utility power out, long lines at gas stations and grocery stores, many accepting cash only. Some hams were victims of this disaster but still provided Amateur Radio support. that depth. Many of these issues are still very close to the surface with us, and we expect them to be for some time. This is normal, we process it. Writing and sharing is part of my process. It's hard sometimes, but it helps. This sharing is some slight good to come from such a tragedy. In that light, I have also just updated our Huntsville-Madision County EMA/EOC/ARES® blog with the sitreps that our group posted to our SEC." 2011 Atlantic Hurricane Season Forecast: "Above Average"
When: Saturday, June 4, 2011, 9AM - 5 PM eastern time. The purpose of this event is to test the National Hurricane Center Amateur Radio station equipment in preparation for this year's hurricane season. Station operators will be making informal contacts on many frequencies and modes. They would appreciate signal reports and basic weather data exchange ("Sunny," or "Rain," etc.) from stations in any location. WX4NHC will be on-the-air on HF, VHF, UHF and 2 and 30 meter APRS. They plan to test on the following voice frequencies +/- QRM: 3.950 MHz, 7.268 MHz, 14.325 MHz, 21.325 MHz, and 28.425 MHz. The operators will try to stay on 14.325 MHz most of the time and announce when they QSY. Here is a link to a current New York Times editorial on the need for an emergency communications system that is compatible across jurisdictions. Interesting reading. The 2011 Dayton Hamvention® is in the history books. I asked Greg Sarratt, W4OZK, who attended the event, about emcomm and ARES forums there. He reported "I spent most of the weekend in the ARRL Emcomm booth meeting ARES® members, EC's, DEC's, served agencies' personnel and many emcomm interested amateurs. I enjoyed talking with many hams from all across the nation about emergency communications. The FCC emcomm and ARRL ARES® forums were informative, must-attend events for ARES® leadership and membership. They were packed. "The FCC's Curt Bartholomew, N3GQ and William Cross, W3TN, gave the Commission's annual emergency communications information update. Discussion items included the ARRL Amateur Radio course for emergency managers, an upcoming emcomm survey, and a review of FEMA head Craig Fugate's speech that included praise for the viability of Amateur Radio emergency communications. 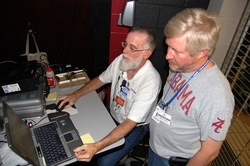 Hosting ARRL Southeastern Division Director Greg Sarratt, W4OZK, summed it up: "Amateur Radio at the 2011 National Hurricane Conference was a success! The Conference leadership recognize the valuable contribution of Amateur Radio operators and again invited us to participate with two sessions at this year's conference held in Atlanta, Georgia last month. What a great opportunity for Amateur Radio." The National Hurricane Conference (NHC), billed as the nation's forum for education and professional training in hurricane and disaster preparedness, was held in Atlanta during the week of April 18-22. Anyone interested in hurricane preparedness, response, recovery and mitigation could hear about and share experiences as they went about planning for the 2011 hurricane season. The conference held at the Hyatt Regency conference center in downtown Atlanta was attended by about 1400 people from federal, state and local governments, the private sector, businesses, VOADs and the ARRL. Amateur Radio was well represented: Representatives from the ARRL, WX4NHC, the Amateur Radio Station at the National Hurricane Center, the Hurricane Watch Net (HWN) and VoIP Hurricane Net (VoIPWXNet) completed several presentations at the conference as well as a presentation at Georgia Tech for area ham radio clubs. Nearly 40 people attended the Amateur Radio Disaster Communications Workshop titled "Disaster Communications, Before, During and After Hurricanes," on the afternoon of April 18. WX4NHC Amateur Radio Coordinator John McHugh, K4AG, and Assistant Coordinator Julio Ripoll, WD4R, explained the 30 year history of their work at the National Hurricane Center and the importance of measured surface data and damage reports. The pair told how this knowledge helps hurricane specialists to make better forecasts. They also told some stories and showed videos from several of the most critical activations over the past few years including emergency communications and interoperability involved in the deployment of operators in the aftermath of the earthquake in Haiti. ARRL Southeastern Division Director Greg Sarratt, W4OZK, and Ken Bailey, K1FUG, Emergency Preparedness Assistant from ARRL HQ surprised Ripoll with an award from the ARRL for his dedication and service during the Haiti earthquake of 2010. On Wednesday, he also received the conference Distinguished Service Award for his tireless efforts over thirty years as Amateur Radio coordinator at WX4NHC. The award reads "exceptional service in providing emergency communication during hurricane events over three decades while leading [the] WX4NHC Amateur Radio station at the National Hurricane Center." For a more in-depth story of Ripoll and the Amateur Radio station he co-founded, click here. Director of Operations of the VoIP Hurricane Net Rob Macedo, KD1CY, gave a presentation on the net and the role it plays in gathering data for WX4NHC. He explained how it also can be used to connect various National Weather Service forecast offices, as well as local and regional Emergency Operation Centers during hurricanes. As Macedo explained "The VoIP Hurricane Net relays info to WX4NHC using any and all means of reliable information from all sources to give WX4NHC the most information possible from the surface during a hurricane." Greg Sarratt, W4OZK, a member of the League's Board of Directors (Southeasten Division) and veteran ARES and emcomm leader, gave a presentation on the Amateur Radio Emergency Service (ARES), how it works in the field and interaction with ARRL HQ. That evening, area hams who could not attend the conference were invited to the campus of Georgia Tech to hear the same presenters give similar presentations. A big thank you to Andrea Hartlage, KG4IUM, ARRL Southeastern Division Vice Director and newly elected president of the Georgia Tech Amateur Radio Club, for arranging the use of the Molecular Science and Engineering buildings lecture hall for the talks. On Tuesday morning, Dennis Dura, K2DCD, and Rob Macedo, KD1CY, were among several speakers who hosted a workshop for about 20 emergency management officials and representatives of government agencies. The workshop focused on situational awareness and disaster intelligence, stressing its importance to Emergency Management and how it creates more opportunities to utilize Amateur Radio. The presentation was followed by a question-and-answer session relating to Amateur Radio emcomm. "Collecting and gathering data and sharing information and reporting during disasters is another way Amateur Radio can assist beyond the typical message handling," Dura said. This rap session concept was started several years ago when Dennis Dura, K2DCD and Greg Sarratt found the forum worthwhile in explaining the ARRL's role in emergency communications to Emergency Management and other served agencies. This interaction continues to prove very valuable to emergency management and Amateur Radio. All sessions were videotaped through the efforts of professional videographer and ARRL Eastern Massachusetts ARES® Assistant Section Emergency Coordinator Jim Palmer, KB1KQW. The videos should be available later this year on the North Shore Radio Association (NSRA) Web site. Meanwhile, be sure to watch videos of pasts NHC conference's and Southern New England SKYWARN related videos. Of special interest to all SKYWARN volunteers was Rob Macedo, KD1CY discussing the Southern New England SKYWARN Program on the Weather Channel. April 26 seemed to just be another day and, as usual, I had already begun the Central Virginia Six Meter Net early to list check-ins. There were two stations from North Carolina near Raleigh already waiting their turns for comments. The phone rang, and the voice on the other end I knew well: it was Bill Mackay, County Fire and Rescue Chief. ARES® was needed as the agency was suffering communications problems. "The dispatch frequency is not working to our fire/rescue stations and we need emergency backup communications at all fire rescue stations and the EOC." My response was simply "OK, Bill." My heart began to race as I began to make several calls. The first was to Ray Clemons, WB4IKL, and within a few minutes he was in route to station Co#6. The next two calls were to Mat Long, N4MI, and Ned Creasy, AE4ID. Just as quickly, they were headed to cover Co#2 and Co #5. I called Rick Cook, AB4U, EC for Hanover County. He only asked "Where do you need me?" He was soon headed to cover Co#3. As I headed to the EOC, Dennis Pinner, N4DEN, came up on the Goochland call-up repeater. After explaining the situation, he responded to Co#1. Within an hour we had five stations and the EOC up and running. I called and advised Chief Mackay that we had coverage in place for all stations except, Co#4. I asked if he wanted the coverage for any stations shifted. He said that the coverage was fine and that he would advise if any changes were needed. We later had "Medic 50" sign up with Beau Bouharoun, N4SIR, an Advanced Cardiac Life Supporter. All stations were able to respond to the EOC when connected as we had all sites already pre-equipped with radios, power supplies, antennas, and manuals with several log and message handling forms. Chief Mackay came into the EOC and asked me to pass along his thanks to all of the radio amateurs. He also expressed his surprise that we were able to respond to the request as quickly as we did. In accordance with protocols, I called to advise the District Six EC of the situation: Anthony Harbour, KG4YXP, is a very good person to have close by in any given situation. He is a great radio operator and computer guru as well as an Advanced Cardiac Life Supporter and Registered Nurse. This call resulted in several other amateur operators ready as stand-bys. Thankfully, business was slow. We handled communication from a call to co#3. There had been an accident and this info was relayed to the EOC. Shortly after noon, with all equipment back in service, a stand down was declared. The call-up had lasted from 0800 to 1230. We were again thanked by Chief Bill Mackay for our support and the confidence he gained in our abilities and willingness to respond. Saturday night, April 16, 8:00 PM -- The York County, Pennsylvania ARES®/RACES/SKYWARN group (YARS) assembled on the air due to an Extreme Weather Alert. Members reported high winds and heavy rain. There was a report of a possible tornado near Hanover, Pennsylvania. Within minutes I heard that familiar sound of a freight train rushing past my house, accompanied by loud cracking noises and a power outage. After it had passed, my wife and I made a visual inspection. Four sections of our fence and a mature spruce tree were down and a huge flowering pear tree was down on the roof of our neighbors' house. I would like to think that the years of training and decades of Field Day practice allowed me to provide my community, the Huntsville/Madison County area, with the level of support that was needed after the tornadoes of April 27. Surely with all my experience helping with Red Cross sheltering after blizzards and hurricanes, all the planning sessions and tabletops and so on and so forth, I had what it takes. What I feel has made the most difference this time is the fact that our EMA is well known and well respected in this community. Add to that the fact that our radio group is also well known and respected by this EMA. These two factors added up to our group's ability to step into action immediately without any need to organize further, or be in-processed as raw recruits might. We were already on the inside. Yes, our training helped. We performed just as we have practiced time and time again, and we adapted successfully to a changing environment. However, I feel that my tasking was greatly empowered by one simple fact: that I held an official credential - a standardized ID card issued by the EMA, and it was easily recognized within the ICS infrastructure on the scene. No one ever challenged my presence or my inquiries. My job could have been more challenging and much less effective. My job on the surface was to pass messages, primarily in support of a VOAD member, the Northern Alabama Medical Reserve Corps. Their task was to establish a field clinic at the Sparkman School, just south of the Anderson Hills area that was so heavily hit. When I realized that this location was also the support base for dozens of visiting law enforcement troops, and was becoming a major supply and staging area, I recognized that I could do more to help than just talk on the radio. I wanted to become a hub of information management: who, what, when, and where. I identified and introduced myself to anyone who would listen: school administration, county commissioners, lunch-ladies and janitors, Sheriff deputies and officers from Madison County, SWAT teams from Montgomery and Mobile, the captains and lieutenants from the National Guard who knew who I was, and even the guy that changed 90 flats on the patrol cars that first night. I spoke with neighborhood residents and volunteers, doctors and patients. My message was simple: "You have questions - I can get you answers." They all knew that they could come to me with their questions. And I knew where to go and who to ask about what, when, and anything in between. Sign-up and show-up - This is really simple, but can't be overstated. Leaders need dependable volunteers and need them to commit early. We need to be able to plan based on the number of volunteers we can expect. So sign-up early, let your leader know if your plans are "tentative," and cancel as soon as you know you cannot attend. That makes the planning job much, much easier. Ten people who become available the "day of" aren't very helpful, unless I have ten unexpected no-shows. Dress like an emergency communications professional -- I feel stupid saying this, but what we wear impacts the image of all Amateurs. Now that we wear orange or green safety vests much of the time, individual fashion expression is not so apparent to served agencies or the public. However, as unpaid professionals we need to look like the paid professionals we work alongside. Smile, Darn Ya, Smile! - We all have better and worse days, but great volunteers develop a "game face" and "game attitude" they bring to public events. Whiners are not allowed. Egos get checked at the door. No, it really isn't about you, it's just what net control said or did, probably without thinking, and usually in the heat of the moment. Seek Feedback (And Offer It) - We all need to talk about what we do well as well as where we could improve. Volunteers need to understand that the people who provide feedback (volunteer bosses) are sometimes insensitive louts. Please forgive us. We didn't mean to hurt your feelings and it really isn't personal. Nor is it personal when you tell leaders how we might improve. We are here to serve the public and our communities and we win or lose as a team. Build Your Skills - Newcomer mistakes must be forgiven. And some people - like me - make the same silly mistakes over and over. But, we need to constantly "sharpen the saw," as the book 7 Habits of Highly Successful People calls it. Great volunteers sharpen the saw on a regular basis. The reason we provide support for all these bike rides, community fairs, rodeos and other non-emergency events is two-fold. Sometimes these events become real emergencies. Mostly, though, we're training for when "the big one" (whatever that is where you live) happens. Use these events to train yourself while having fun. Then read, take classes, do free online training, anything to improve your skills. Reading this newsletter is a good use of your time. Help solve problems - I was really pleased at a recent event when our volunteers at a remote site solved problems that occurred at their location without help from anyone. It was an issue related to signals and geography and these were new hams - all KJ6 call signs - who took initiative and made things better on the spot. And some people say HamCram hams are know-nothings! In the process, they improved our ability to serve the organization we were working for. Great volunteers give great customer service. Observe Lines of Authority - Not long ago, I came unglued (it had been a bad day) when a fairly inexperienced volunteer tried to do something that went against the goals of the organization. It was not ill-intended, just inexperience. But, it was the second or third problem. This was a hugely promising volunteer, who just needed to understand why certain things are done the way they are. Even insensitive louts sometimes have good reasons behind their logic. Making the troops as happy as possible is key for any manager's success--especially when the workers are not getting paid. Leaders exist to support their volunteers, not vice versa. - ARES® E-Letter Contributing Editor David Coursey, N5FDL, is an emcomm leader in San Joaquin County, California and author of the N5FDL.com blog. I am responding to the "HamCram" article and comments in the last issue. I have been licensed since 1959. I have been an active member of Nassau County, New York ARES® for nearly 30 years. I have worked with kids in school radio clubs at least since 1977 when I started work at Brooklyn Technical High School (W2CXN). My home club is the Long Island Mobile Amateur Radio Club (LIMARC) where I presently hold the title of Education Committee Chair. I am a retired public school chemistry teacher. In my experience trying to teach classes to high school students and adults, traditional multi-session courses have not been very effective. The attrition rate has been very frustrating. Many who start never get to the exam. In the past year I have led a team of volunteer instructors in four 1-day cram/review sessions. The ground rules were that everyone who signed up was required to study in advance. We suggested, but did not prescribe which books, media, on-line resources, etc. they needed to use. These sessions that started at 8 AM and went through the question pool by 3:30 PM were followed immediately by VE sessions administered by a separate team of VEs. The results were most encouraging. The Technician session results were 15 of 15, 13 of 13 and 4 of 7. The three who did not pass at the last session told us that they had not studied in advance. On April 10, the same team conducted a General class upgrade session resulting in 9 of 11 passing. One missed by one question and one had not studied. The bottom line is that these cram/review sessions only work when a person is committed enough to have done some individual studying. We maintain a Yahoo group as a forum for support. Our experience has been that passing grades were typically 30 correct or more, including several 35s. Our view is that getting the license is similar to what I used to hear about driving. Get the license and then learn to be a driver, or in this case an Amateur Radio operator. LIMARC and our county ARES® and CERT/RACES groups are all working to provide the hands-on experience in drills and public service events that are needed to make them effective. We are exploring the idea of more traditional classes aimed at filling in the gaps that were glossed over during the pre-exam review sessions. The model that seems to be coming together would be open to all interested regardless of license held. There would be no pressure or anxiety about taking an exam at the end. Topics would be chosen from the various license manuals with sessions held prior to our regular monthly meetings. The comments about inexperienced operators not knowing how to manage their stations in an emergency are a real concern, but it has always been so. Our fellow hams have always responded to emergencies when the need arose. I remember the first hurricane that I operated in, Donna, in 1960. When an Avianca plane ran out of fuel and crashed on the north shore of Long Island, there was an ad hoc response that was overwhelming. The same was true in the days after the 9/11 attacks in NYC and during the 2003 blackout. I have experienced all of the things on the lists published in the last couple of issues by David Coursey, N5FDL. I would add that probably the most important "Do" is to communicate freely. Sometimes this is the most difficult, but it really needs to be emphasized. What we did in New Mexico when we established the state SAR organization is to ask each team what they thought their expertise is/was. Then we made it clear to them that they would be called when we needed that expertise, otherwise they would be put on standby. That way we did not wear out all of the teams. I found a simple and economical way to have all the battery power I need: Get the correct size AA holders from a place like Jameco or Parts Express and put a few in parallel for longevity. Then add a flexible cable with a power connector on the end that will fit your HT. The battery holders generally will fit nicely into a small arms army surplus ammo pouch and fit on any belt even though the pouches are made for the ALICE belt (that belt is also the most comfortable). See my emcomm web page. In re last month's article on Twitter alerting, the author suggests creating a "strong password that you might share with just a few people in your group so they could post the alert if you were unavailable. Board members or the club president would be some examples of who you might grant posting access to." Formidable Footprint is a free online Emergency Response Tabletop Exercise Series sponsored by Disaster Resistant Communities Group (DRC-Group), Depiction software, and Stoneybrook Group LLC. It is a Web-based interactive real-time drill which will take about three hours to complete. It features pictures, video, audio and interactive maps. Teams from all over the nation and some international teams participate. Although it is targeted to CERT and Neighborhood groups, I feel it has a lot of value to ARES® members because: 1) Many types of decisions and contact data are common to all groups and can be tested by this drill, and 2) ARES® volunteers are not going to be available if their families and/or neighbors need them. The better their family and neighbor can plan for any disaster, the better their availability for helping others. Summit County ARES® will gather at a single location and work through the drill as a team. Details can be found here. For a good overview of the process, you can view the online video found here. We went through an interactive flood event to be used to elicit responses from our team at various points, such as "Is this request within the responsibility of our group," and "Who would our group contact to handle this item," etc. After the drill there was an online hotwash and we received a report of all our responses to the "injects" such that we can use it for an after action report. Other drills in this series include Wildfire (March 26), Tornado (April 30), Influenza Pandemic (May 28) and Hurricane (June 25). I think ARES® should publicize the availability of these FREE Tabletop exercises!